The Bible may be the most bought book in the world, but it is also often the least read and least applied due to a basic lack of understanding and motivation on the part of readers. Read the Bible for Life aims to improve biblical literacy in the culture and the church by simultaneously moving readers toward greater skill in reading the Bible well and toward a deeper commitment to applying Scripture to everyday life. Through a series of down-to-earth conversations with some of today's brightest scholars, author George Guthrie discusses the basic tools and attitudes needed to read the Bible more effectively. 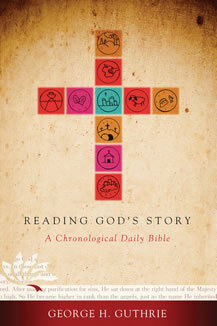 Chapters focus on the various types of literature in Scripture and how to read them well. For instance, how should we read a psalm differently than we read a parable? How should we read a story of the Old Testament differently than we read a letter from Paul? How can we engage these various parts of Scripture in a way that is truly life-changing? The book also discusses issues such as reading the Bible in context, choosing and reading a Bible translation, reading in times of sorrow or suffering, and reading the Bible with your family. As we better understand how to read the Bible skillfully, we begin to see how every person of the Bible, every psalm, and every teaching fits into the Bible's powerful, overarching story, and we begin to realize our place in the story that God is still writing in the world. Read the Bible for Life - Leader Kit by George Guthrie is a whole-church approach to greater biblical literacy. This study equips individuals and churches to better understand the Bible by introducing readers to its history, genres, interpretation, and proper application to transform lives through reading and studying God's Word. God inspired the biblical writers to use a variety of literary types, including stories, poetry, proverbs, parables, and others. Utilizing small-group teaching sessions and interviews with Bible scholars, Read the Bible for Life author George Guthrie explores three dynamics in reading the Bible well: listening, understanding, and responding. He identifies tools for understanding the Bible and encourages viewers to create life space and heart space for the study of Gods Word.